Rental Info — Swell Booth Photo Booth Co.
We've taken all the elements of the original photo booths and given it a thoroughly modern upgrade while still maintaining that authentic experience every time you get in and pull back the curtain. Our booth is easy on the eyes and won't loom over your event like a creepy dark changing tent. We'll work with you to create a thoughtful design that embodies your personality and works cohesively with the look and feeling of your event. 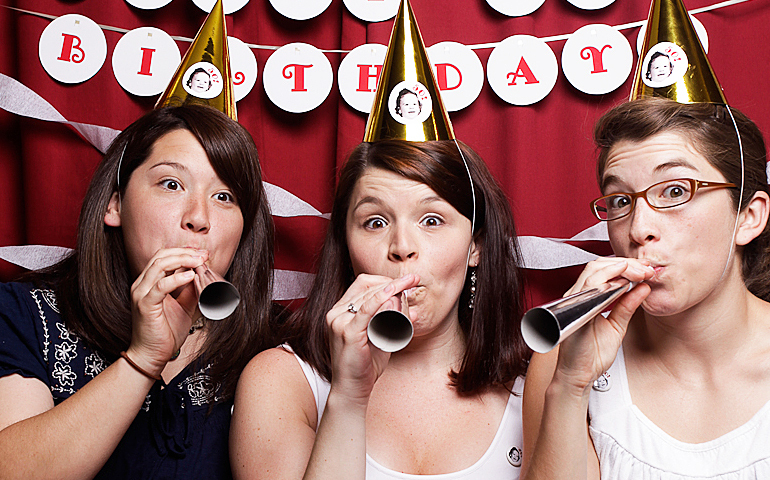 If you're a photo booth purist at heart, opt for no artwork on your strips and prints for a more traditional look. Real, live, hold-in-your-hand prints, just like the good old days! Archival quality, these guys come out in less than 30 seconds from start to finish. And the best part is, you can do it over and over again as many times as you can stand it. Choose from double 2x6 strips or single 4x6 prints. 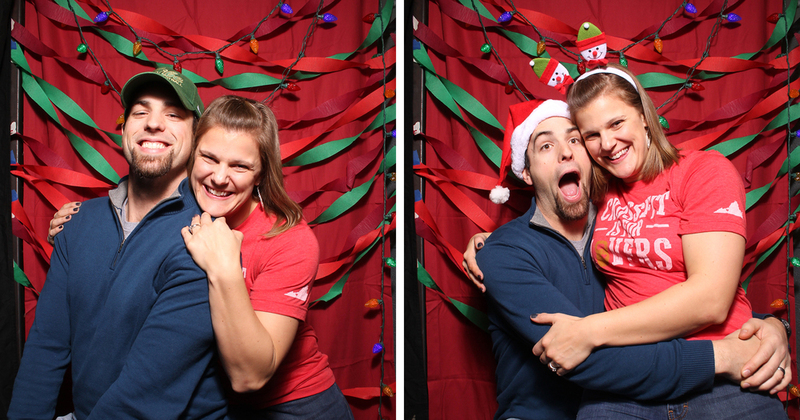 After each event, you and your guests can view, share, and download their awesome photos from our online gallery. Everyone loves getting dressed up, especially with our suitcase of props full of hats, glasses, mustaches, chalkboard bubbles and more. Our default case comes with every booth rental, or you can request a custom case full of themed props. Give us a ring and we'll get you a quote! Our knowledgeable and skilled booth attendant will not only deliver and set-up your photo booth, but will also ensure it runs like a champ during your entire event. They'll assist any guests who may need it and keep the prop box nice and neat. A starting rate of $775 gets you four hours of unlimited photo booth usage, including all the amazing things above—with the ability to add or subtract hours for $100 per hour. Discounted rates are available for weekday events. Have a special request? Get in touch and we'll get you a quote! Swell Booth is currently only servicing events within a 1 hr driving radius of Christiansburg, VA.
Go home with a one-of-a-kind keepsake from your event with a made-on-site scrapbook. 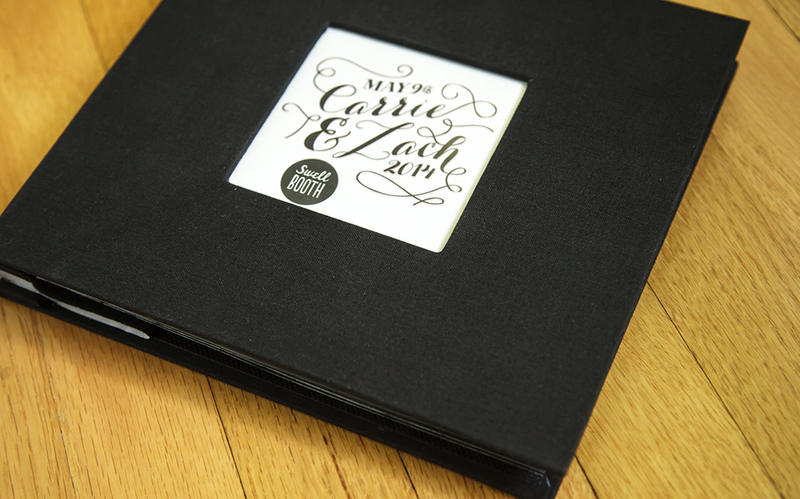 Comes with a black, postbound album, archival black paper and plastic sleeves, photo safe adhesive, metallic pens, scissors (when you want to get crafty!) and a photo booth attendant to make sure each guest has no problems leaving a photo and message for the guest of honor or newly hitched couple. Want to customize it? Ask us for ideas and a quote! If you like the comfort of knowing all your photos are permanently written to physical media that you can access even without the internet, you can get a copy of all the high-resolution images mailed to you on a lovely compact disc. Pirate themed? Mardi gras? Hipster 80's night? School colors? Life-size cardboard cutouts? Superheroes? We got you covered. Let us know what you have in mind and we'll put together a bangin' prop box that your guests will have a ton of fun with, and also look really good in! Give us a call and we can talk about your ideas! Want to go for the classic pleated curtain? We have four different curtain colors to choose from: natural, black, red, and vintage blue. Or maybe you want some retro wood paneling, glitter and glam, neon stripes or flowers? How about a custom painted canvas, a paint-by-number inspired backdrop, or your company logo (red-carpet style)? Let us know your vision and we will do our best to make it happen. We can give you advice in creating your own DIY backdrop for free, or provide our services in creating or printing backdrops for an additional cost. Contact us for a quote! 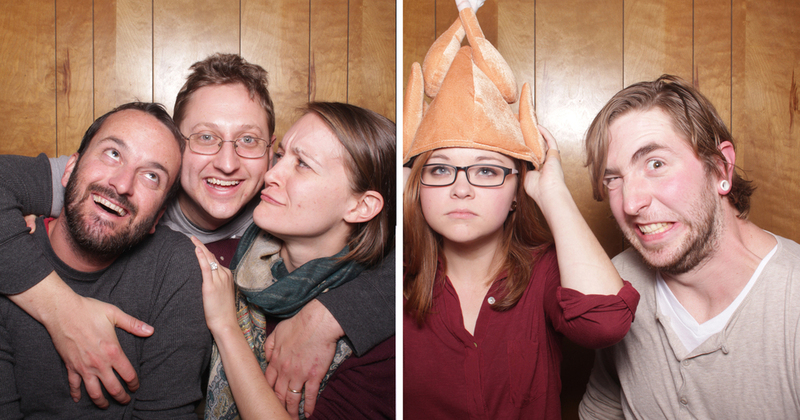 The classic, iconic photo booth strip--and our personal favorite--gives you three poses AND double copies. So you can keep one and share one. Four poses in a vertical format gives you more space to fit more faces. Plus, it's frame-ready! Classy, mysterious, glamorous--whatever look you're going for, everyone looks good in our classic black and white. We work closely with each of our clients to create a thoughtful, one-of-a-kind design that compliments your personality and event, or promotes your brand--all without detracting from the photos themselves. 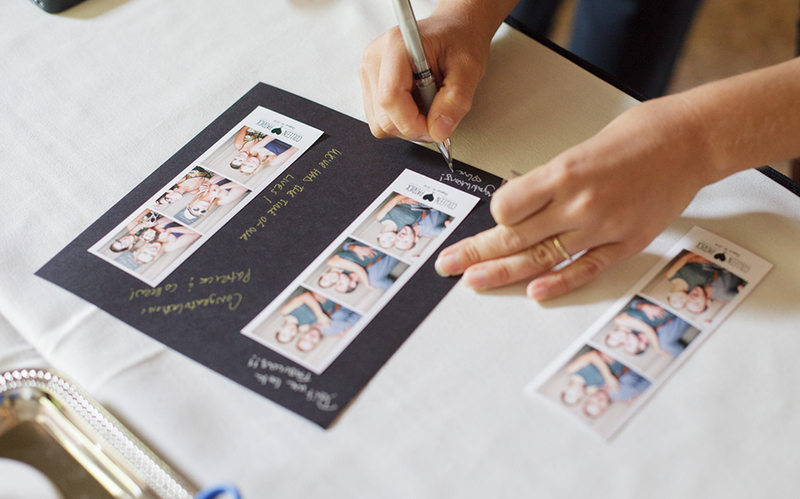 We won't lie--we love the straight-up photo strip or print without any artwork running along the bottom--bringing that authentic feeling of photo booths of yore. We love doing custom booths too, just ask and we'll get you a quote!